This book illustrates how the boundaries created to manage and market tourist destinations are the root of the practical and academic problems that trouble destination management these days. 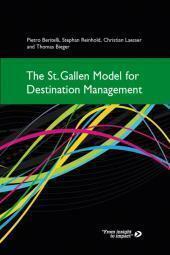 The St.Gallen Model for Destination Management (SGDM) introduces an alternative perspective based on strategic visitor flows that allows transcending past boundaries. The book builds on practical experience and ongoing research; it targets practitioners, students, and scholars with a concern for the viable long-term development of tourist destinations.